Dieting at this time of year could impair your body's ability to fight the flu virus, a study warns. US researchers found mice who were put on a calorie-controlled diet found it harder to tackle the infection than those on a normal diet. The findings, published in the Journal of Nutrition, suggest that contrary to the old adage "starve a fever", those with a temperature should eat well. Flu cases in England and Wales are currently approaching a nine-year high. The team at Michigan State University found even though the mice on the lower calorie diet received adequate amounts of vitamins and minerals, their bodies were still not able to produce the number of killer cells needed to fight an infection. As well as being more likely to die from the virus, the mice - which were consuming around 40% of the calories given to their counterparts on a normal diet - took longer to recover, lost more weight and displayed other symptoms of poor health. "Our research shows that having a body ready to fight a virus will lead to a faster recovery and less-severe effects than if it is calorically restricted," said study author Professor Elizabeth Gardner. Even those who have received the flu vaccine should steer clear of dieting until the warmer months arrive. "If the strain of flu a person is infected with is different from the strain included in the flu vaccination, then your body sees this as a primary infection and must produce the antibodies to fight it off," Professor Gardner said. The study, the team added, should not be seen as a carte blanche to avoid dieting all year, but to reserve weight control to the eight months of the year when flu is not so virulent. The latest flu data from England and Wales has shown cases are up 73% on last year; experts believe the unusually cold weather may have contributed to the surge. 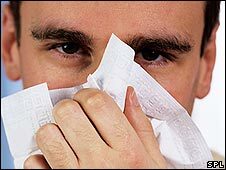 Professor John Oxford, an influenza expert at Queen Mary's School of Medicine and Dentistry, said "common sense should prevail at this time of year". "There are a lot of viruses and while it might have been better to avoid those extra helpings of Christmas pudding in the first place, now is not the time to be thinking about diets."